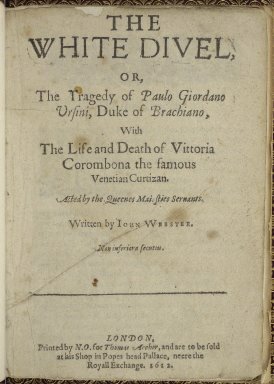 THE WHITE DIVEL, OR, The Tragedy of Paulo Giordano Vrsini, Duke of Brachiano, With The Life and Death of Vittoria Corombona the famous Venetian Curtizan. Acted by the Queenes Maiesties Seruants. LONDON, Printed by N. O. for Thomas Archer, and are to be sold at his Shop in Popes head Pallace, neere the Royall Exchange. 1612. Title page imaged from Folger call number: STC 25178. Image is not from the transcribed copy.